Windows 10 will not only automatically download and install quality and security updates but also the driver updates. This is especially true for graphics card drivers. Generally, automatic driver installation is pretty good because this eliminates the need to manually find, download and install the drivers by yourself. However, from time to time, Windows might download wrong or incompatible graphics driver. In those situations, Windows 10 will either crash or the graphics card will not work properly. Recently, I've shown you how to pause automatic updates and how to stop Windows 10 from automatically installing drivers for all devices. If you don't want to go to the extream and just want to stop the automatic graphics driver update then follow the below steps. To stop the automatic graphics driver update, we are going to use the devices hardware IDs and the Group Policy Editor. 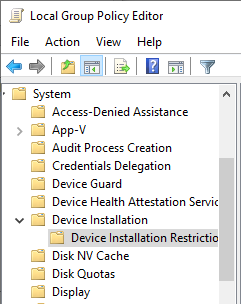 All we have to do is tell Windows not to install drivers for a device that has a specific hardware ID(s). 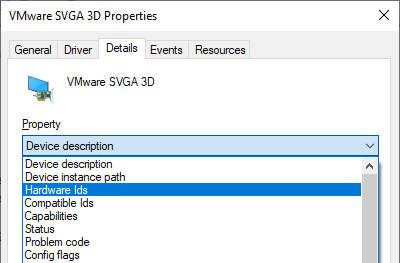 Since hardware IDs are unique to each device on your system, this works perfectly to stop Windows from automatically installing the graphics driver update. 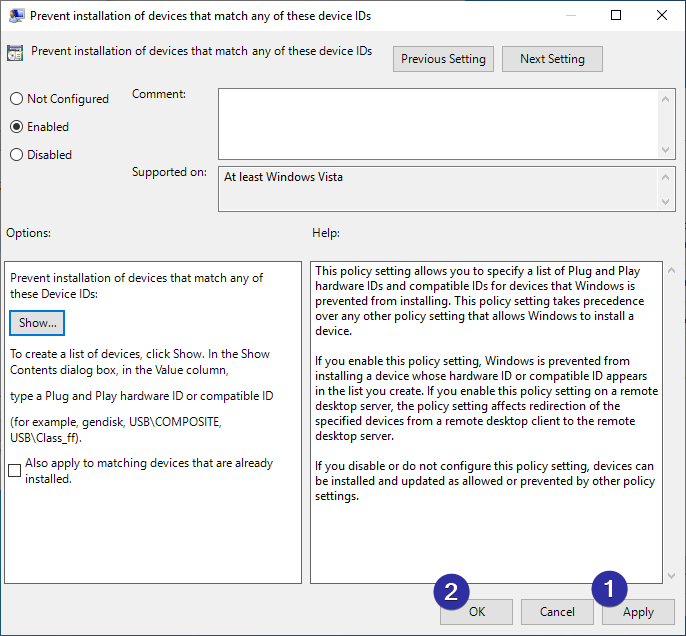 Note: Since we are going to use the Group Policy Editor, this method works only on Windows 10 Pro devices. Warning: Before proceeding, make sure that you've manually installed the compatible graphics driver and disconnected from the internet. 1. The first thing we need to do is know the hardware IDs of the graphics card. Thankfully, the device manager gives us all sorts of information including the hardware IDs. So, open the start menu, search for "Device Manager" and open it. 2. 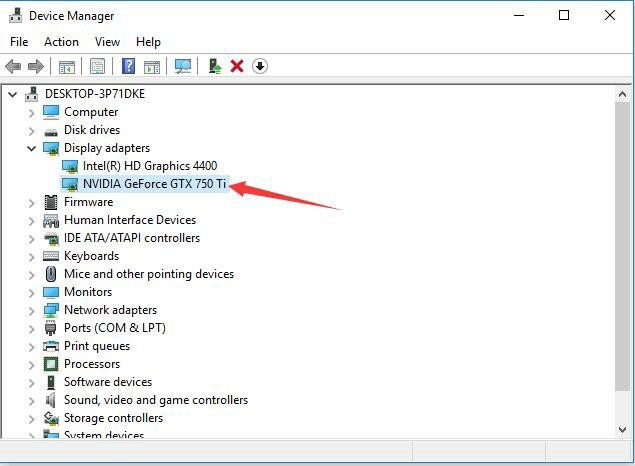 In the device manager, expand the "Display Adapters" section and you will find your graphics card. In my case, the graphics card is Nvidia GeForce GTX 750 Ti. Right-click on it and select the option "Properties". 3. In the properties window, go to the "Details" tab. Now, select "Hardware Ids" from the dropdown menu under the Property section. 4. This action will show the hardware IDs of the graphics card. Generally, you will see four different hardware IDs. Keep this window opened and proceed to the next step. We'll come back to these IDs in a bit. 5. We now need to find the target policy where we can use the hardware IDs. So, press Win + R, type gpedit.msc and click on the "Ok" button. 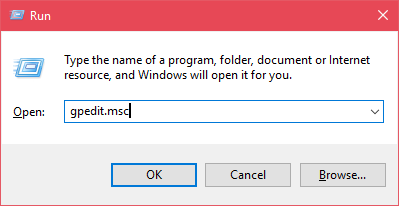 This action will open the Group Policy Editor. 6. In the group policy editor, you will see different folders on the left panel. Go to the following folder. This is where we will find the relevant policy that blocks Windows 10 from installing the graphics driver. 7. 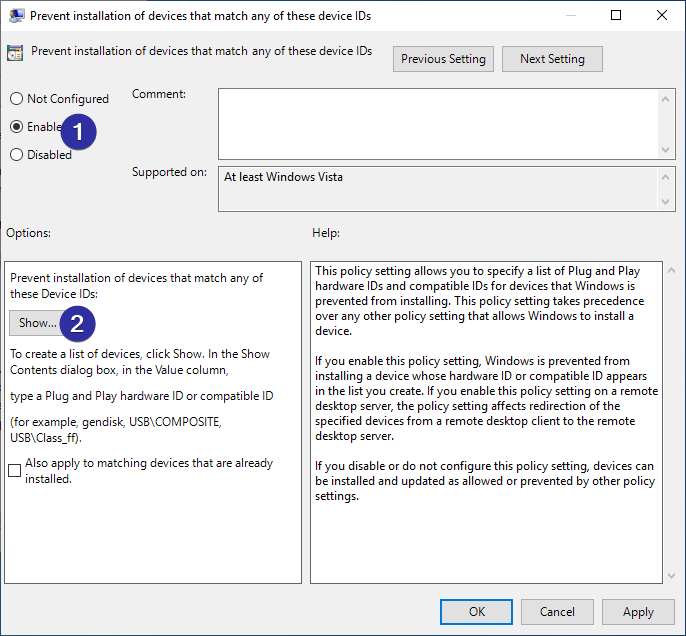 On the right panel, find the "Prevent installation of devices that match any of these device IDs" policy and double-click on it. 8. In the policy properties window, select the "Enabled" radio option. This action will enable a few more options under the Options panel. Click on the "Show" button. 9. The above action will open the "Show Contents" window. 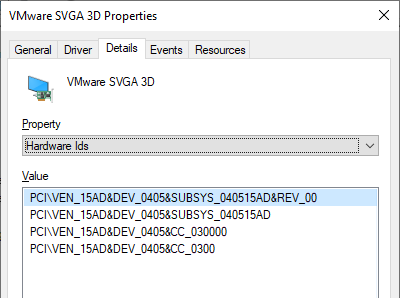 Here, we need to enter the hardware IDs we have previously seen in step 4. To enter the hardware IDs, right-click on the hardware ID, select copy and then paste it in the "Show Contents" window. Once you paste all the four hardware IDs, this is how it should look like. Click on the "Ok" button to continue. Note: Double-click on each column in the Show Contents window to be able to paste the hardware ID. 10. In the main policy properties window, click on the "Apply" and "Ok" buttons to save the changes. 11. Though we've changed the group policy, the policy settings are not yet applied. To apply the changed policy, restart Windows 10. That is all. After restarting, you can safely connect to the internet. Windows 10 will no longer install or update the graphics driver. In fact, all forms of driver installation or updating is disabled for that specific device. When you want to update the driver for that specific device, you need to manually disable the policy. To disable the policy, simply select the "Disabled" option in step 8, restart the system, and you are good to go. That is all. As you can see, it is quite easy to stop Windows 10 from installing or updating drivers of a specific device. If you like this article, do check out how to hide Windows 10 updates and how to uninstall Interent Explorer in Windows 10.